Antioxidants, vitamin A and vitamin K are the top benefits you’ll gain from green barley. While barley sprouts are often touted as great sources of a long list of nutrients -- and they do contain many vitamins and minerals -- one dose of supplemental powder has less than 10 percent of the daily value for most nutrients. When you buy green barley supplements, be sure that any generic claims are backed up by specific information in the nutrition facts panel on the label. Barley is well-known as a whole grain used in soups and a variety of dishes. Kernels of barley are also used to make malt, which is used in beer, malted milk and other products. Green barley is produced by sprouting barley seeds and harvesting the leaves. Then the leaves are dried, ground into powder and sold as supplements. Some supplements only report the amount of barley powder in a serving, without giving information about specific nutrients. Whenever possible, choose brands that report a complete nutritional profile on the label. Vitamin K is essential for making blood clot. It also contributes to bone density by regulating calcium deposits. Your brain and nervous system depend on vitamin K, where it helps cells grow and function properly, reported an article in Advances in Nutrition in 2012. Leafy greens, including green barley sprouts, are some of the best sources of vitamin K, but the amount you’ll get varies depending on the product. One brand provides 44 percent of the daily value per dose, while another brand has 75 percent of the daily value, based on consuming 2,000 calories daily. You can count on getting vitamin A from green barley powder. While one brand reported 90 percent of the daily value per dose, that’s much higher than most other brands, which have 10 percent to 20 percent of the daily value. Green barley sprouts contain vitamin A in the form of beta carotene, reports the New York Farm Viability Institute. Beta carotene fills two roles. It's an antioxidant, and your body also turns it into retinol, which is the active form of vitamin A. In addition to supporting normal vision, retinol is essential for healthy skin and a strong immune system. A group of molecules called free radicals are so reactive that they can harm vital molecules throughout your body. Antioxidants interact with free radicals, which neutralizes them and prevents damage. Green barley contains several antioxidants, including vitamin C. You can expect to get about 15 percent of the daily value of vitamin C per dose, but some brands may have double that amount. 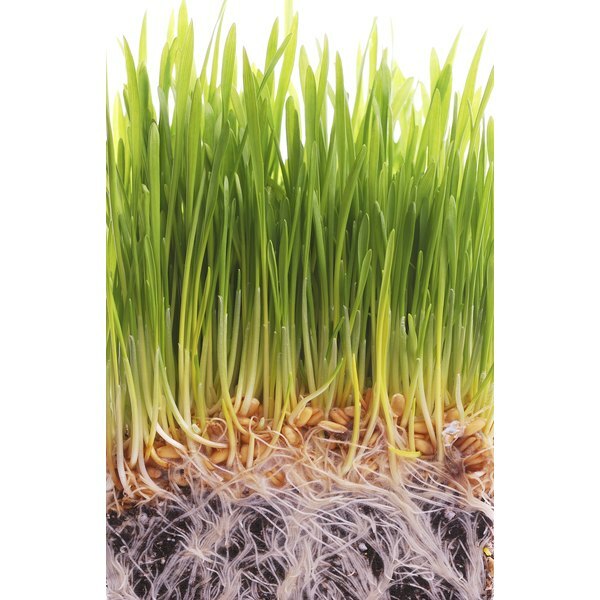 Barley sprouts also have a natural plant-based antioxidant called saponarin. Researchers from the University of California reported that saponarin prevents free radical damage in fats, which may help prevent cardiovascular disease, according to an article in the Journal of Agricultural and Food Chemistry in June 2012.